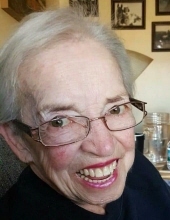 Roberta Theresa Lawson, 84 , of Lapeer, died Monday, January 14, 2019. She was born September 19, 1934 in Hamden, Connecticut to parents John and Josephine (Pascucci) Quigley. At the age of 12 years old, Roberta “Bert” toured the county with her brother John Quigley as the “Quigley’s Professional Trick Riding Team”, with the Roy Rogers Show. She married Robert Thomas Lawson, Jr. on May 21, 1955 in Cheshire, Connecticut, the Lawsons were blessed with over 60 wonderful years together. Mrs. Lawson was a founding member of the Zonta International Group in Lapeer, an organization empowering women through service and advocacy. Mr. and Mrs. Lawson were longtime, devoted members of Immaculate Conception of the Blessed Virgin Mary Catholic Church in Lapeer. She was an accomplished golfer, but above all a loving wife, mother and grandmother. Roberta is survived by her son: Robert (Melissa Mohr-Lawson) Lawson, III of Lapeer, grandchildren: Blake (Melissa), Brittany, April (Dale), Aimee, Samantha, great-grandchildren: Avah, Alexa, Dylan, Peyton, siblings: Lucille Lombardo of Tuscan, Arizona and John (Mardell) Quigley of Phoenix, Arizona. She was preceded in death by her loving husband: Robert T. Lawson, Jr.; grandsons: Robert IV and Brock; as well as her parents: John and Josephine Quigley. Private services are scheduled at Immaculate Conception Church. Burial will be in Mt. Loretto Cemetery, Lapeer. Memorials may be made in lieu of flowers, to the Whaley Children’s Center, 1201 N. Grand Traverse St., Flint, MI 48503.Please share condolences and memories at www.MuirBrothersLapeer.com. "Email Address" would like to share the life celebration of Roberta Theresa Lawson. Click on the "link" to go to share a favorite memory or leave a condolence message for the family.